These are heady times for enthusiasts: We get to enjoy a huge selection of fast, truly street-legal tires from a wide range of manufacturers. The prices are fair, too. This is all courtesy of the universal adoption of 200-treadwear street tires across multiple, popular competition venues. The popularity of these 200tw tires has driven manufacturers to focus tremendous attention on this category. And that attention keeps delivering new products: The old four-to-six-year refresh cycle has been shortened to just a year or two as the performance bar is constantly pushed ever higher. It’s an outright tire war-and we all win. As grip has increased, though, tire life has dropped. This has brought increased sales and led to some supply chain shortages. Participants now need to have a Plan B that includes both an alternate tire and correlating setup specs. Three new contenders have recently entered this world: the Nexen N FERA SUR4G, Hankook Ventus R-S4, and BFGoodrich g-Force Rival S 1.5. That means, of course, that it’s time for some more testing. 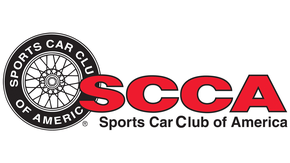 Our test vehicle would be the ex-GRM Street Touring Miata, which won a pair of SCCA ProSolo championships back in 2006. It’s now being campaigned by multi-time champ David Whitener. Since this is his car and it’s set up the way that he likes it, David served as the primary test driver. Fellow multi-time champ Andy Hollis ran as a guest to add veracity to the data. We used our permanent test course and skidpad marked on the expansive, medium-grip asphalt of the airport in Mineral Wells, Texas. Tire sizes were 225/45R15, all mounted on Street Touring-legal 15×7.5-inch wheels sourced from 949 Racing. Our prices for all of the tires tested came courtesy of Tire Rack’s website; note that these prices can fluctuate over time. Our test day dawned with partly cloudy skies and temperatures in the low-80s, rising to the mid-80s by the end of testing. We began with sets of three- lap passes around our skidpad in order to identify basic tire characteristics and explore heat tolerance and optimal warm tire pressures. These sessions also determined whether or not water was needed to cool the tires. Once we had our basics handled, we then proceeded to the test course to dodge some cones. Subjective impressions were collected, while objective lap times were developed using two sets of two-lap runs for each driver. Tires were sprayed after each pair of laps. 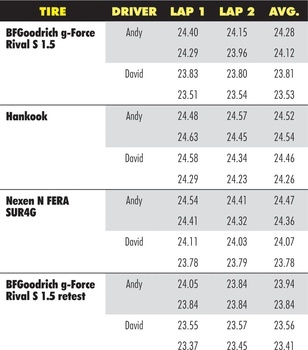 The whole affair was bracketed with BFG’s Rival S 1.5 as the control tire, since that is what David typically runs in competition. This cryptically named tire comes from a total newcomer to the UHP market. It was originally introduced in 2016 to a mild market response. 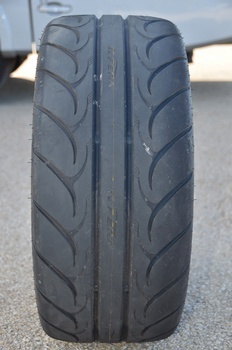 Early adopters reported solid performance, but the Nexens were not as quick as the top-of-the-pile Rival S and the Bridgestone RE-71 R tires. Nexen responded to the lackluster sales by hiring on a pair of champion autocrossers to further development. Jason Isley and Bryan Heitkotter spent multiple days working through its tire variants on test vehicles ranging from a camber-challenged Street-category car on narrow wheels to a Street Touring car set up with wide wheels and an optimal alignment. So, basically, they covered two extremes. Early indications are that their work was successful, as Heitkotter has won numerous national autocross events this year on the Nexens. 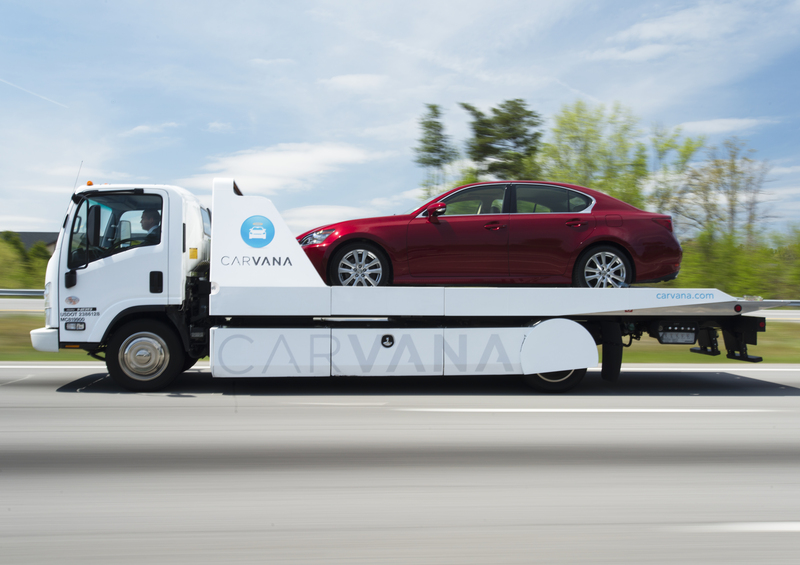 A few other factors have helped the manufacturer quickly establish a toehold: a very generous contingency program, and backorder status for key Bridgestone and BFG tires. We put the Nexen around the circle first, and it did not disappoint, generating lap times that were among the fastest of the day. The tire exhibited a wide plateau of grip, with the ability to run large slip angles before finally letting go. This also made it feel a little vague, especially since it does not talk much. We found only minor changes in overall lap time as pressures were reduced, but spraying the tires made a significant improvement. In short, this one cares more about temperature than pressure. The Nexen was also quick on the practice course, especially for David, who likes to hang out the tail a bit. His take-home feelings: “Really awesome, very fast, easy to feel, progressive loading.” Andy kept finding more and more speed as he searched for the tire’s limit. He also observed that it’s a likable, drivable tire. The timer agreed with our impressions, ranking the Nexen second for both drivers- but only just barely. Hankook has long been a favorite in the track day and budget enduro world. Their Ventus RS line has traditionally delivered consistent grip, good heat tolerance and long life. Hankook was also the first manufacturer to introduce the 225/45R15 size. They initially offered their R-S2 in that then-unusual size, and that tire worked well on track day Miatas and early Hondas. When the R-S3 came out, that 225mm size found a home in Street Touring autocrossing–again on a lot of Miatas and Hondas. The R-S3 also worked spectacularly well for general lapping and crapcan racing, as it thrived under excess heat. As the 200tw tire wars escalated, Hankook released the Version 2 variant; it traded off some of that longevity and heat tolerance for higher levels of grip. Early reports on the R-S4 indicated that Hankook had mixed together the attributes of their past two favorites to produce even more grip than the R-S3 V2 while capturing the slower wear rate and higher heat tolerance of the original R-S3. Around the skidpad, we found the R-S4 a little tricky to place right on the cones. 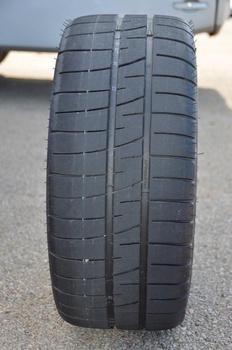 Compared to the Nexen, the Hankook preferred small slip angles. After a few laps, though, we smoothed out our lines and stayed within the tire’s smaller sweet spot. That said, the edge of adhesion was quite obvious and the Hankooks easily recovered from overdriving. As with the Nexen, tire pressures seemed to have little effect on lap times, while the R-S4 also did not seem greatly affected by temperature. On the test course, the Hankook was a great dance partner through the slalom as it delivered precise turn-in. It just lacked the overall grip necessary to hang with the others in the sweepers. David had a hard time getting used to the required steering input and occasionally got behind, having to restart the run. The Hankook was also the slowest of the bunch by a few tenths. Early last year, we tested a new variant of the BFG g-Force Rival S that we dubbed the 2016 edition, since it didn’t have an official name at the time. BFGoodrich planned to release that tire in time for the 2016 competition season, but production delays pushed it past the SCCA’s eligibility cutoff date. BFG didn’t shelve the tire, though, and instead built up stock for an early 201 7 unveiling. The manufacturer has designated it the g-Force Rival S 1.5. This variant replaces only the smaller sizes of the original–just those with the three-rib tread design. The new tire also bears a different speed rating: V versus the four-rib Rival S’s W rating. The design change is fairly minor, yet it provides crisper turn-in on smaller cars. To us, it felt like some toe-out had been added to the front tires. Feedback from competitors has been universally positive, and BFG continues to offer a great contingency program for its successful customers. Having done extensive skidpad work last year on this tire, we opted to simply run it for time in each direction at optimal pressure. Times on the circle were right there with the Nexen, suggesting similar levels of steady state grip. As our control tire, the BFG was run on the test course at both the beginning and end of the rotation. Each driver found only a tenth in the final session, confirming the quality of our data. David loved the BFG’s ability to multi-task coming into and out of corners. Andy called it the best of both worlds: huge grip and very responsive. It was also the fastest tire, but only just so. As usual, a day of testing raised as many questions as answers. The BFG was quickest, right? Yes. But did that happen because the car was set up around that tire? Maybe. Could the Nexen improve its ranking with some additional setup work? Possibly. For sure, Nexen has made huge strides with this tire and will be a major player. On the downside, it also showed the highest wear rate of all three tires tested, and also the most heat sensitivity. This suggests that autocross and street use are going to be its forte, not long track sessions. 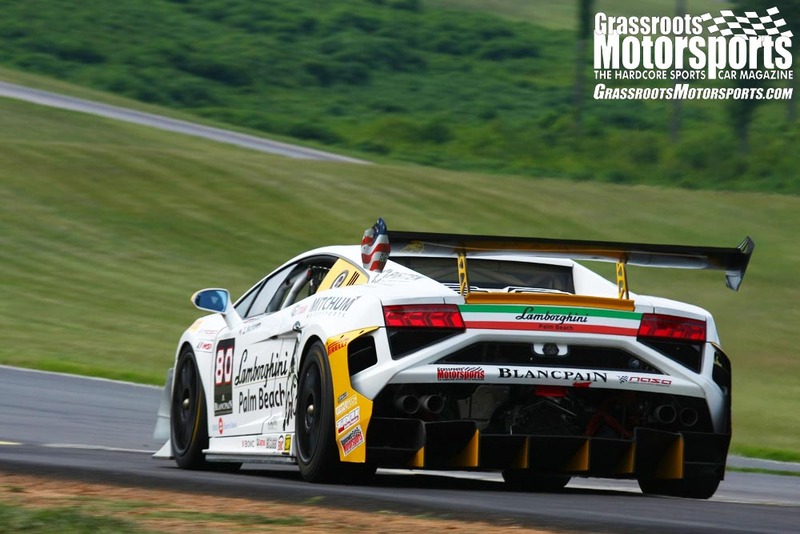 The Hankook was in the ballpark around the cones, but delivered slightly slower lap times. It did so with very little wear, though, and no falloff from overheating. 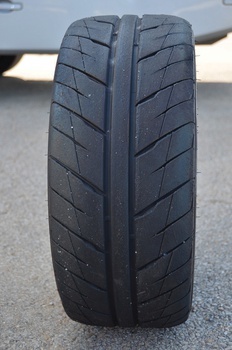 This suggests that it could make a great tire for lapping days and low-buck enduros; it could also be a solid budget alternative for autocross. Looking for a single tire that can do it all well? The Hankook R-S4 is that tire. Is the Nexen a new tire with the same name? Sounds like they've made some big improvements. This from Nexen-------We did change the name slightly. From SUR4 first edition to the SUR4G which was tested this time around. ... but how do these compare to the RE-71R? How could I have missed that! :) Thanks! Was wondering the same thing. Probably depends on driving style and car weight/tire size. At least that's what seemed to separate the Rival and the RE71R. Like the "available at wal-mart for $30.00" Nexen? Nexen is basically what Kumho was in 2000 or so.